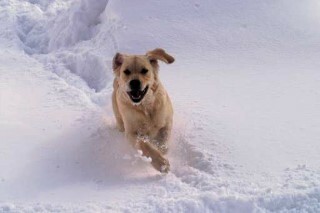 Snow turns the world into one huge outdoor adventure for my dog, Zarah. She prances, runs, eats it and sticks her nose as far into the snow as she can. The fact that she is unable to speak my language, her joyful play makes it obvious how grateful and happy she is. The snow this past Friday was no different, but I noticed something that I hadn’t observed before. Once the newness of the snow wore off, Zarah let the beagle in her take over and began sniffing out the voles that make their home under the snow. At one point, her nose and head were buried so deep in the snow, intent on catching her prey that she missed an easy catch as a vole popped up from the white ground behind her and ran in a hopping manner toward the woods. Thanksgiving reminds us to be grateful for those things we have, and in doing so, it helps us see those things we often miss throughout the year. There is some evidence that being thankful on a daily basis contributes to psychological health and makes us more joyful. Before I continue, I think it is important to recognize that the holidays can be a time of sadness and anxiety for some who grieve what is not there (family, friends, etc.) The absence of these things cannot and should not be easily dismissed nor the feelings associated with those absences. If this is the case for you, may there be some peace in your heart as you go through this holiday season. But if you are still not convinced that being thankful plays a role in a more joyful life, you can perform your own study. You don’t have to be a traditionally trained scientist to discover if these findings are true for you. Test it out. Try gratitude for a certain amount of time and – see what happens. Now, back to the gratitude experienced by my dog last week. I’m curious how grateful she might be about the snow if she had to shovel the sidewalk. From our home to yours…..Happy Thanksgiving.